Zoomcar India Pvt. Ltd, which operates a self-drive car rental service, said on Thursday it has raised $24 million (Rs 161 crore) in a Series B round of funding led by US auto giant Ford Motor Company’s newly created ‘smart mobility’ unit. Ford Smart Mobility LLC will invest along with existing investors Sequoia Capital, Nokia Growth Partners and Empire Angels, Bengaluru-based Zoomcar said in a statement. VCCircle had first reported in July that Zoomcar was in talks with for possible investment from Ford Smart Mobility, which will design, build and invest in new-age mobility solutions. Zoomcar will use the funds to develop its marketplace model and enhance technology. It also intends to significantly expand its airport offerings across all cities. The marketplace model, called Zoomcar Associate Program (ZAP), was launched earlier this year. It allows individuals to purchase vehicles on behalf of Zoomcar, list the vehicle on its platform, and then share the profits on a monthly basis. The company expects the marketplace model to account for over 75% of its vehicle inventory by early 2017. The funding will allow Zoomcar to achieve its goal of a fleet size of 25,000 in 25 cities by 2018. The company currently has a fleet of 2,000 cars and operates in seven cities in the country. Greg Moran, co-founder and CEO of Zoomcar, said Ford became the company’s first automobile partner in 2013 and that this investment highlights that the two companies share the same values and vision related to urban mobility. “Customer experience will remain our highest priority as we scale ZAP across India in the months ahead,” Moran said. 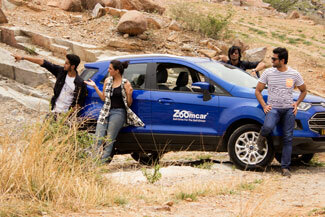 Zoomcar was founded by US nationals Moran and David Back, who worked on sustainability solutions. The firm follows a hyperlocal model backed by a mobile app where customers can pick up cars from designated locations. It launched operations in 2013 and raised $11 million from Sequoia Capital, Nokia Growth and Empire Angels in July last year. Zoomcar claims it has doubled bookings in the past year and that it records 75% occupancy. Its app has recoded 1.5 million downloads, the company says. The company competes with the likes of Carzonrent-owned Myles, Revv, Voler and JustRide. JustRide secured angel funding in August 2015. Delhi-based Voler raised an undisclosed amount of funding in June this year. For Ford, this investment expands its presence in the world's fastest-growing major economy. The company entered India two decades ago but has struggled to make a big mark in the country’s auto market where it competes with Maruti Suzuki India Ltd, South Korea’s Hyundai and a host of other companies such as General Motors. However, it has lately experienced some success thanks to the popularity of its compact sport-utility vehicle EcoSport and the Figo hatchback. Ford had launched its smart mobility initiative in March to invest in promising mobility-related ventures and join the growing transportation services market. The company also runs a global three-month acceleration programme called Techstars in Detroit, US, for innovative mobility solution startups and has mentored around 745 companies since 2007 which together raised $2.2 billion. Like Ford, General Motors and Japan’s Toyota are also investing in new-age mobility solutions such as car-sharing and ride-hailing apps. Toyota has invested an undisclosed amount in Uber, Volkswagen has backed its rival Gett with $300 million investment while GM has put in $500 million in Lyft.